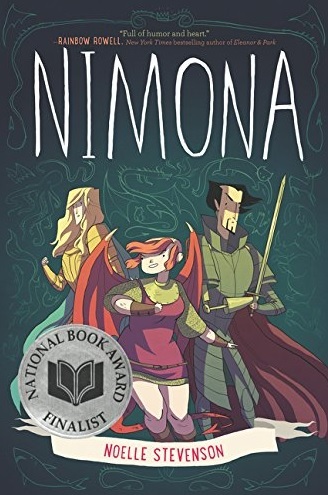 Noelle Stevenson manages to juggle “adorable” and “bloodthirsty” like a pro acrobat with Nimona, dazzling readers with a story that’s alternately funny and heartbreaking. 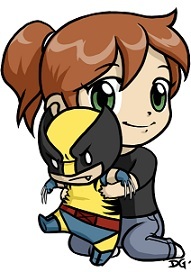 In this webcomic turned graphic novel, the titular Nimona is a young shape-shifter seeking work as a sidekick to Ballister Blackheart, aka “the biggest name in supervillainy.” She begs him to let her help with his plans against his archnemesis Goldenloin, usually acting more as a loose cannon that he must scramble to control than a helpful assistant. Whether she’s in her normal human appearance, a fearsome dragon, or a shark with a respectably large set of breasts, she’s generally the more aggressive character, and much of the story revolves around the supervillain having to be the voice of reason and mercy. The setting is a fun mash up of old-timey fantasy, steampunkish fare, and even a few modern touches. It’s a world with dashing knights in shining armor jousting on noble steeds, spooky Victorian science labs, and television news broadcasts. I loved how Stevenson mixed and matched from multiple time periods freely to create her own unique world instead of just plonking down her characters in a cookie-cutter setting. The pacing and length were both solid. Nothing felt rushed or dragged out, and I felt like I got my money’s worth for the $12.99 price tag. 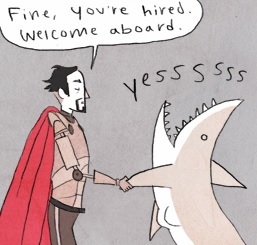 While Nimona does at times turn darker than its whimsical beginnings would lead you to believe, it’s not a story that revels in misery. It’s balanced and mature, neither being too dark nor so light as to lack real substance.